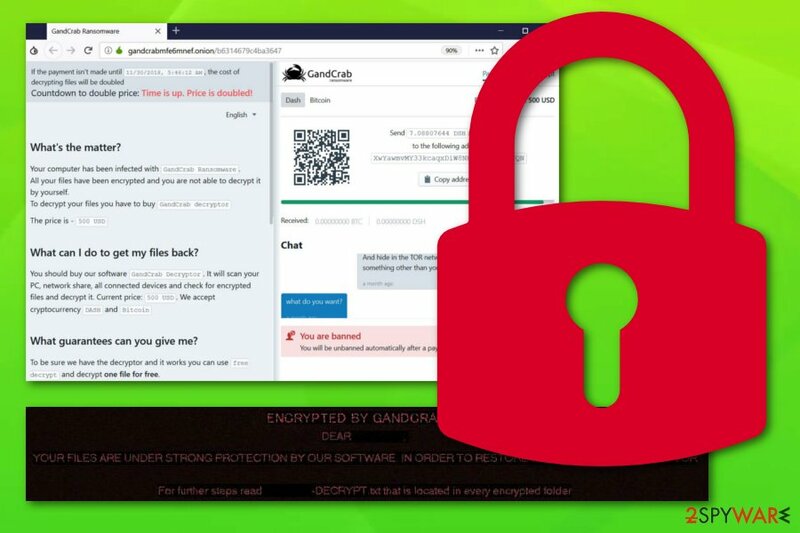 Gandcrab 5.1 is one of the most active Gandcrab ransomware variants which first showed up in January 2019. 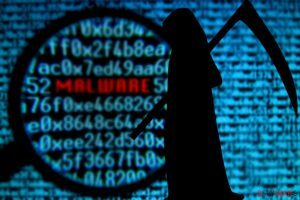 The crypto malware family that is considered to be one of the most prolific cyber threats in the recent years is created in order to encrypt users' personal files and then demand ransom in Dash or Bitcoin for the decryption key. To make data unreadable, Gandcrab 5.1 virus uses Salsa20 encryption algorithm and appends an extension which consists of random characters. After the modification of victims' documents, pictures, music, videos, databases, and other files, the virus changes the desktop wallpaper consisting of a brief message and drops a ransom note “[victim's_ID]-DECRYPT.txt” into each of the affected folders. Hackers explain that users need to pay $1200 and contact them via the Tor network. Gandcrab V5.1 used several distribution methods, including Fallout EK, fraudulent email attachments, and even the PowerShell command in a picture of a video game character Mario. Fortunately, security researchers announced that this prominent variant can be decrypted now with the help of Bitdefender's decryptor. 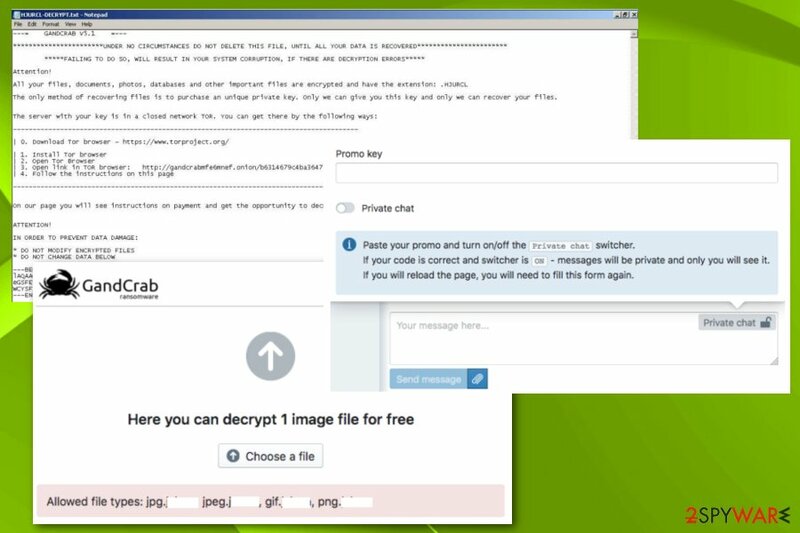 Gandcrab 5.1 ransomware is using a unique algorithm to lock the targeted files which is called Salsa20. Even though the crooks might threaten the user that the only way to recover lost data is by paying them, be clever and do not rush to pay the demanded ransom price! According to tech experts from Virusai.lt, such crooks are very likely to scam the victims. We suggest performing the Gandcrab 5.1 removal with reputable tools only. Furthermore, note that you need to detect all virus-related content in the system, otherwise, if you leave some hazardous components on the computer, you might not be able to perform any data recovery methods successfully. 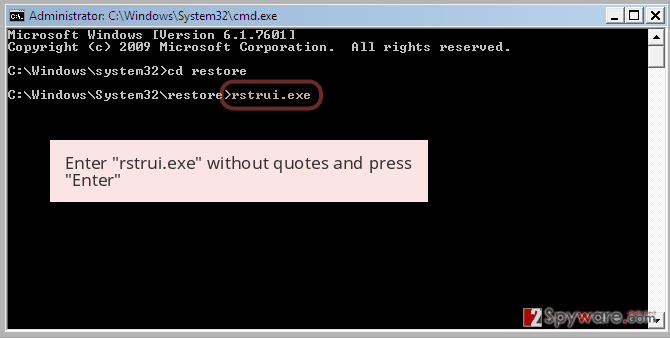 For malware detection, use Reimage or another similar program. Once you remove Gandcrab 5.1 from the system, you can proceed with some file restoring methods that we have provided at the end of this article. 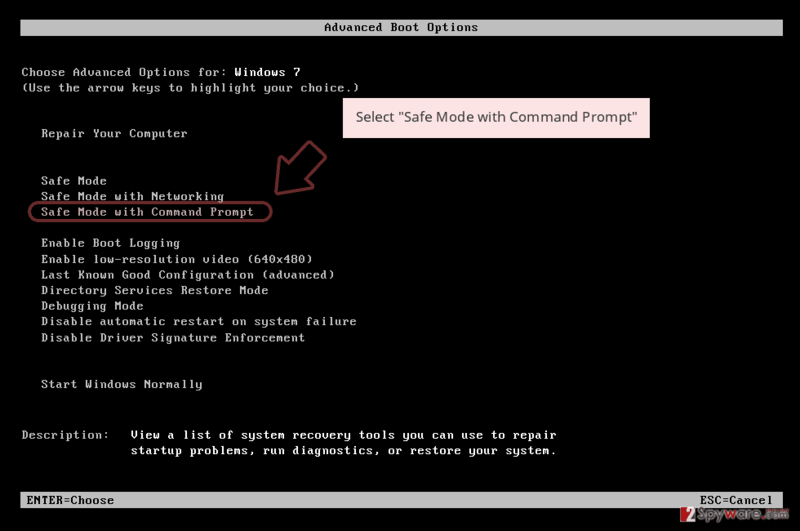 Furthermore, make sure that you boot your computer to Safe Mode with Networking or activate the System Restore feature to disable the ransomware and all its activities permanently. Unfortunately, Gandcrab 5.1 decryptor is still in the development, so there is no official tool you can download to disable the code that made your files useless. If you lost your files, be sure to find your backups after eliminating this malware from the system. This is the most effective way to recover encrypted data. If you can't find them or if you simply don't have them, try using third party tools that are given at the end of this removal guide. It is also known that Gandcrab 5.1 ransomware is capable of erasing Shadow Volume Copies of the target files which means that files can hardly be restored by using Shadow Explorer. If so, the ransomware virus manipulates a Windows component named wmic.exe which performs the elimination of the Shadow Copies. According to the latest findings, GandCrab v5.1 has started relying on exploit kits, e.g. Fallout EK, to infect systems with its code undetected. Additionally, virus authors have changed tactics on the initial encryption process, file extensions and the ransom page. 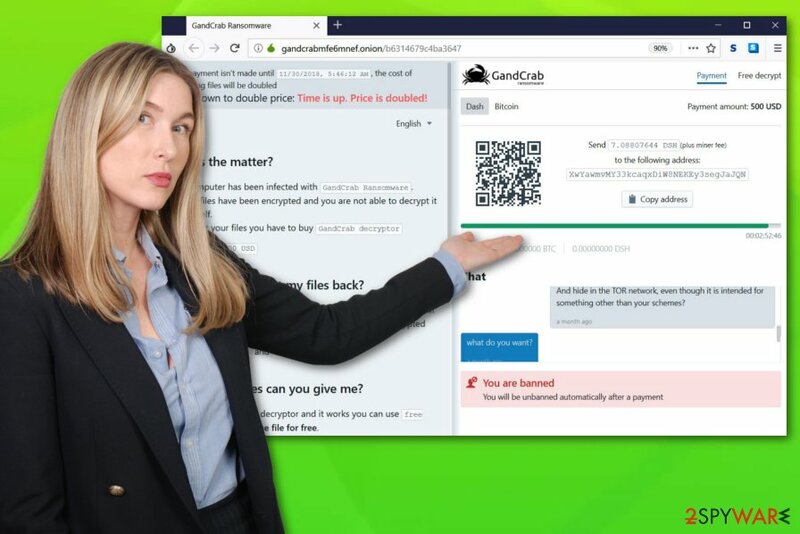 When, in most cases, ransomware appends one specifically generated extension to the encrypted data, GandCrab now uses randomly created IDs to mark files. Each of them also gets its own TOR browser page with ransom payment instructions. The unique ID appeared when the updated Fallout exploit kit came to light in early January 2019. Since January 15th, this Fallout EK activity was linked to the delivery of GandCrab ransomware. Alongside this exploit kit, the particular GandCrab v5.1 ransomware was recently discovered as the secondary payload in the distribution of Vidar infostealer. 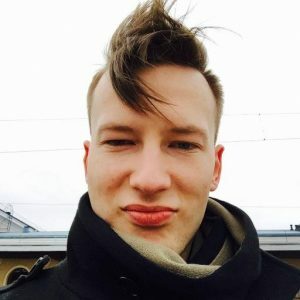 The campaign is also using exploit kit to infiltrate targeted devices and, once infected, drop Vidar malware together with the ransomware on the computer. Nevertheless, Gandcrab 5.1 virus is also capable of spreading via rogue online websites, software cracks, adware, and similar downloads, so make sure you are very careful while browsing the Internet and avoid downloading software packages such as Merging Image to PDF, Securitask, SysTools PST Merge. Be aware of questionable-looking links and other components that you overcome while browsing. If you ever enter a rogue website, make sure that you close it immediately and never return to it again. Additionally, make sure that you carefully track all your incoming downloads which you can do in the Custom or Advanced settings' section. 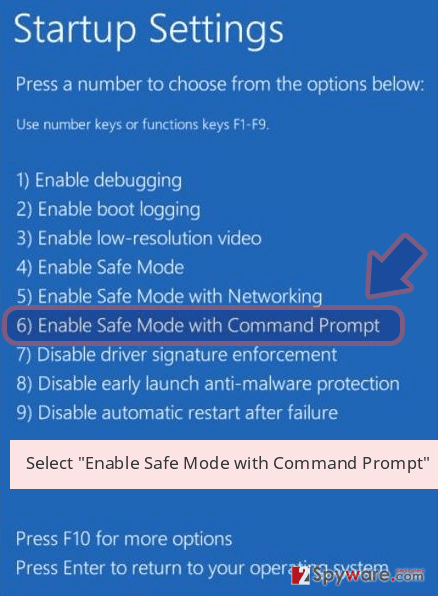 Furthermore, ensure that no installation step was skipped as you might miss some hazardous content and let it successfully infiltrate your computer system. GandCrab v5.1 ransomware is distributed via Fallout EK and as a secondary payload in different malware campaigns. If Gandcrab 5.1 has occupied your computer and locked all of your valuable files, you should eliminate the ransomware virus before you perform the recovery process. First, detect all malware-laden objects in the infected system. We suggest downloading and installing one of these tools: Reimage, Malwarebytes MalwarebytesCombo Cleaner, or Plumbytes Anti-MalwareMalwarebytes Malwarebytes. These programs are capable of scanning the entire computer, finding damaged entries, and detecting unsafe components. Note that Gandcrab v5.1 removal cannot be performed manually as hazardous components might be missed by the human eye. 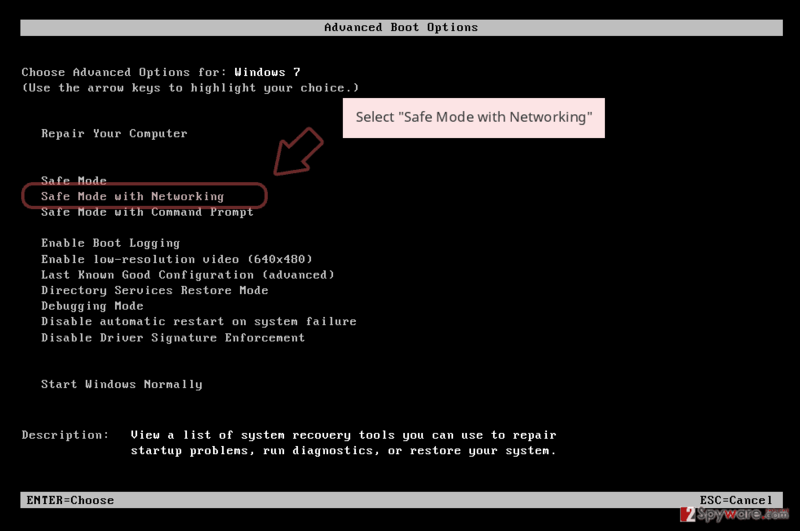 Additionally, make sure that you reboot the system to Safe Mode with Networking to disable the malicious activity. After this, take a look at our below-provided file recovery steps. Complete the methods exactly as shown in the instructions. Log in to your infected account and start the browser. Download Reimage or other legitimate anti-spyware program. Update it before a full system scan and remove malicious files that belong to your ransomware and complete Gandcrab 5.1 removal. 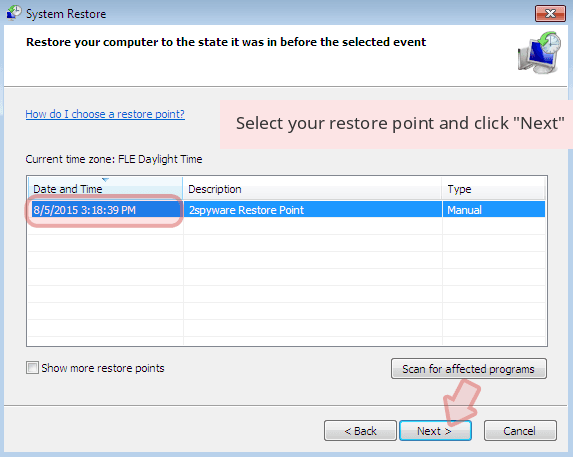 When a new window shows up, click Next and select your restore point that is prior the infiltration of Gandcrab 5.1. After doing that, click Next. Once you restore your system to a previous date, download and scan your computer with Reimage and make sure that Gandcrab 5.1 removal is performed successfully. 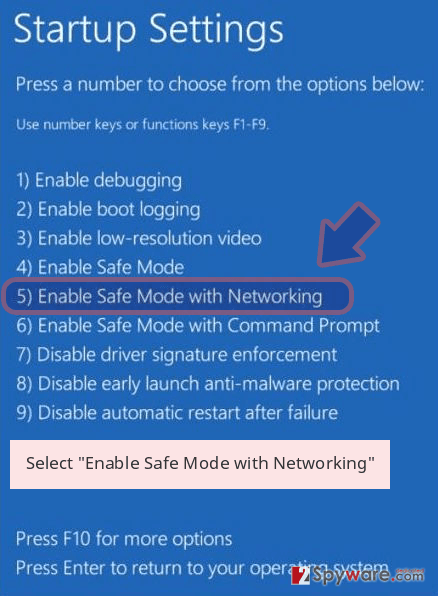 Guide which is presented above is supposed to help you remove Gandcrab 5.1 from your computer. To recover your encrypted files, we recommend using a detailed guide prepared by 2-spyware.com security experts. Finding encrypted files means that a ransomware virus has performed rogue and damaging activities on your computer. You can recover some data by performing our below-mentioned recovery steps. This tool might help you recover lost or encrypted files. If you perform each step exactly as shown in the instructing methods, you should succeed. 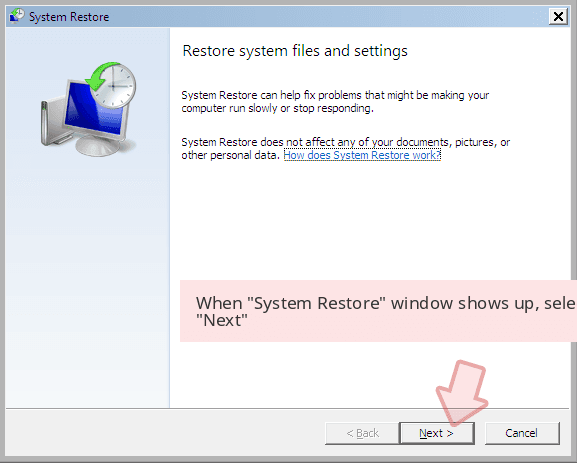 If you have enabled the System Restore feature before the ransomware attack, this method might work correctly for you. Some versions of the virus are known to eliminate Shadow Volume Copies of the target files, so there is a high chance that this method won't work. Try other options instead. ^ Monica Chin. It's a Me, Ransomware! Super Mario Image Hides Malicious Code. Tom's Guide. Tech Product Reviews. ^ Bogdan Botezatu. GandCrab Ransomware decryption tool. Bitdefender. Security blog. ^ Salsa20. Wikipedia. The free encyclopedia. ^ Virusai.lt. Virusai. Virus news and avoiding tips. ^ Vangie Beal. Shadow Copy. Webopedia. IT terms and computer definitions. ^ Malvertising campaign delivers Vidar information stealer and GandCrab ransomware. Securityintelligence. Analysis & insight on information security. You can quickly scan the QR code with your mobile device and have Gandcrab 5.1 ransomware manual removal instructions right in your pocket. How did you remove Gandcrab 5.1 virus?